Notes And Updates: RV Refrigerator Manufacturers have implemented a number of "Recall Campaigns" in which they will install a module to shut down the fridge before it becomes unsafe. 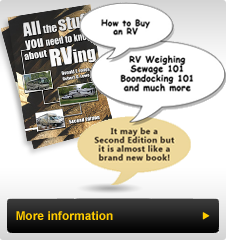 These recalls are handled by a RV Service facility and are free of charge to the RVer. This module shuts down power to the control circuit of the refrigerator when unsafe bolier temperatures be sensed. Check your fridge maker's website and enter the information requested to ensure that your appliance is fully in compliance. There may have been more than one recall and not all owners have had the latest update completed. This is a serious safety issue and should be addressed promptly. I had the opportunity early in the New Year to walk though a RV Dealer's lot and walk through some new Bounders. I marveled how far we have come in value for the money. One item that impressed me was the pricing range: from a well equipped gas rig at $109,000 to over $201,000 for a diesel model. In walking through the delivery area, I saw the vehicles new Bounder buyers were moving up from. Some were older Bounders, others were competitive brands and one was a mid 90's American Eagle in superb condition. I talked with a RVer at a park near where we stayed and his comments emphasized what we already know and what I saw in the delivery area. He had owned a Bounder prior to his current coach and he commented that a Bounder was (and still is) "the best bang for the buck!" He misses his Bounder. From a technical perspective, all Bounders are built on a variety of chassis that give both weekend RVers as well as full timers enough capacity to carry "all their stuff" safely. With 22.5" wheels and larger tires these Bounders ride and handle like high end coaches of just a few years back. The power and performance of the new Bounder is excellent with well over 300HP, 450 ft/lbs of torque passing power to the road through five and six speed automatic transmissions with overdrive. On the utility front, 50 Amp power is standard and whole coach water filters with a 10 gallon water heater is standard. I have never seen as many floor plans, some with a mid coach entertainment area, - the latest trend in motorhomes. Many models have increased the storage capabilities and with across the coach under floor storage re-appearing in 2008 rigs we see features that were the trademarks of a Bounder. In 2008 this storage is combined with many luxury features that were only available on diesel coaches just a few years ago. A Bounder is better value than ever.